The Very Rev. Dr. Peter Jackson was called to be a Bible translator at the age of thirteen when he learned that there were thousands of languages that the Holy Scriptures had not been translated into. He graduated from the University of California at Berkeley with a degree in linguistics, and then did graduate studies with Wycliffe Bible Translators in Dallas, Texas, where he was also a teaching assistant in linguistics. While in Dallas, he met Matushka Styliana, who was born in Minneapolis, but raised in Colombia, South America, in family of missionaries who worked among the primitive Kogi people. Once married, the Jacksons moved to Colombia as missionaries, where Father Peter analyzed the grammar of the Kogi language, developed a writing system for it, and translated the New Testament from Greek into Kogi. Their sons, Reader Nicolas and Reader Benjamin, were born in Colombia, and after ten years there, the Jacksons were baptized into the Holy Orthodox Church. They returned to the US, and Fr. Peter studied at Holy Trinity Seminary in Jordanville, New York. He was ordained to the priesthood and served as rector of Sts. Theodore Orthodox Church (ROCOR) in Buffalo, New York, for fifteen years. He also earned his Doctor of Ministry degree from Pittsburgh Theological Seminary’s joint program with Antiochian Village’s House of Studies. Throughout their time in Buffalo, the Jacksons prayed for the Lord to open a door for them to serve the Orthodox Church in the Spanish-speaking world. 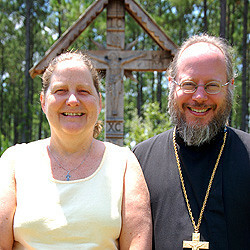 Father Peter will help teach and train future clergy and catechists for Latin America, while Matushka Styliana will help instruct and encourage clergy wives and the faithful in Orthodox faith and practice.